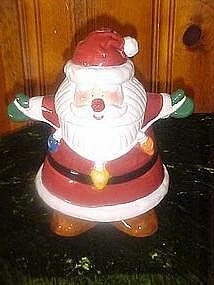 A great Santa Claus cookie jar. He is holding a string of Christmas lights. Made of hand painted glazed ceramic. Made by Asia Master Group. Pristine condition. Measures 11 1/2" tall.